The programming and implementation of an athlete’s training off-season training is executed to primarily enhance the physical qualities (PQ’s) necessary for partaking in their particular sport of participation as well as assist in the prevention of injury. 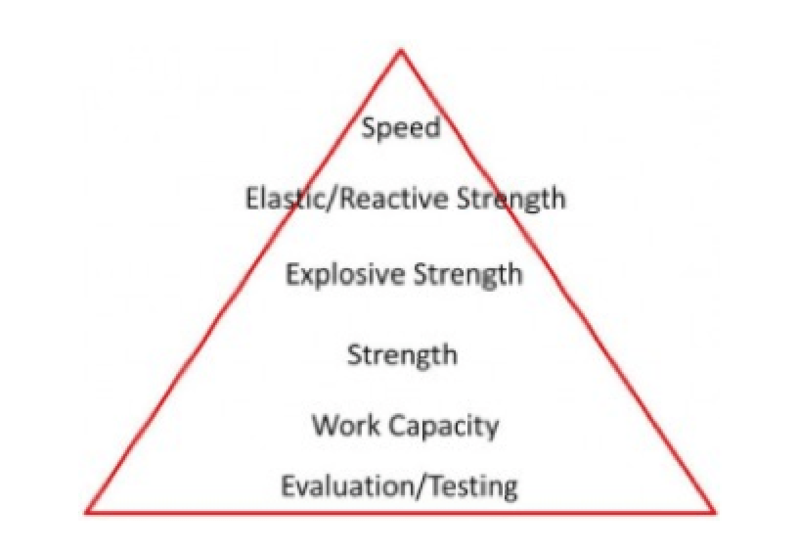 These PQ’s acknowledged in Hall of Fame (HOF) Strength and Conditioning (S&C) Coach Al Vermeil’s Hierarchy of Athletic Development include strength, explosive strength, elastic/reactive strength, and speed (Figure 1). Off-season physical enhancement training is required not only to continue to improve the athlete’s physical capabilities, but to also keep pace with the competition who is participating in off-season training as well. This training process may result in the athlete achieving new personal records (PR’s) in some or perhaps all of their weight room exercises. One may inquire as the upcoming football season is just around the corner, how may the athlete maintain their off-season PQ achievements in-season? As I travel around the country presenting at conferences and visiting both institutions and teams I have had many conversations with football S&C Coaches regarding their programmed training during the in-season. 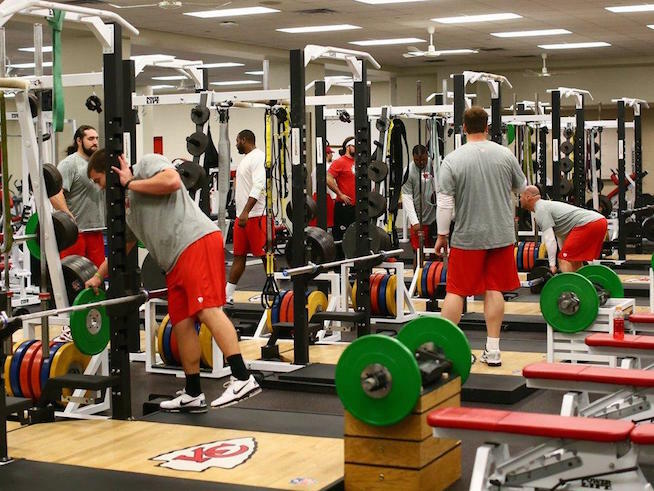 These discussions have exposed a concern with athlete’s lifting very heavy weights in the midst of practice, game day, and other physical entities that occur during the competitive season. Some coaches limit the athlete’s exercise performances to an intensity of 80% of their off-season accomplishments. This training philosophy is perplexing as why would any coach be satisfied with a 20% deficit in an athlete’s PQ’s when extreme physical efforts transpired during the off-season to achieve these improvements. Why is it desired for the athlete to be 20% weaker at the time they are required to perform at optimal levels? Would any coach be satisfied with an 80% effort and skill level on game day? Is maintaining and even improving an athlete’s PQ’s in-season possible? •	NY Giants running back Joe Morris setting a PR in the Power Clean the Wednesday prior to a Saturday playoff game. He rushed for 202 yards that playoff game. •	One NY Giant Super Bowl team set 35 PR’s in one or more weight room exercises the week prior to their first playoff game. 1. The Right Kind of Player – It all begins with the player and the athlete involved in this type of high intensity training must be competitive, respond to his team as well as his coaches. He must have a good self awareness and assessment of his physical abilities. He must not be lazy or the type of player that is always considering “a way out” to avoid hard work. 2. The Right Kind of Head Coach – The Head Coach must support his Head S&C Coach and this type of training. He must also schedule high tempo and succinct practice sessions as prolonged and drawn out practices may excessively fatigue the players over time. This may not only place a limitation on their physical abilities during the in-season training, but likely in practice sessions and game day performance as well. 3. The Primary Exercises – The exercises emphasized in this high intensity training scenario are squats, cleans, and presses. Variations of these exercises should transpire monthly. For example, back squats to front squats, Cleans are varied via different bar positions for the exercise performance, etc. Accessory exercises are also utilized at higher intensities as monthly changes should be applied to these exercises as well. It is recommended that a limited number of accessory exercises be prescribed but always include the low back and abdominals. 4. Exercise volume – The exercise volume should be kept low for both the overall exercise category as well as the volume of each exercise set. Sets of 2 and 3 repetitions (reps) will evolve to an increased number of single rep sets as the season progresses. 5. Weight intensity – when appropriate, weight intensities of 90% to 95% (as well as higher weight intensities) are incorporated in each of the squat, clean, and press categories twice monthly. This will provide the athlete with the opportunity to perform 6 high intensity lifts every 30 to 31 days. Players need intensity in their work, not just work. A concept that is easy to comprehend but difficult for many S&C Coaches to trust is one taught to me years ago by Charlie Francis when Charlie, Al Vermeil and I all worked together while consulting for an NFL football team. This concept is often reinforced to me by my good friend Derek Hansen. A 90% to 95% effort is still SUBMAXIMAL. For example if an athlete has the ability to sprint a 10 second 100 meters and trains running an 11 second 100 meters (a 90% effort) it is an easy effort for them, yet still provides a stimulus for improvement. In a recent conversation with my friend S&C Coach Brendon Zeigler, we discussed the athlete’s who are coached well and are technically proficient in their exercise performance will utilize less energy (not waste energy) in executing a heavy lift, thus technically sound higher weight intensities performed at low volumes result in a stimulus for adaptation and improvement, not a cause for wasted energy and excessive fatigue. Coach Zeigler’s athletes also perform high intensity weight room exercises during the in-season. 6. 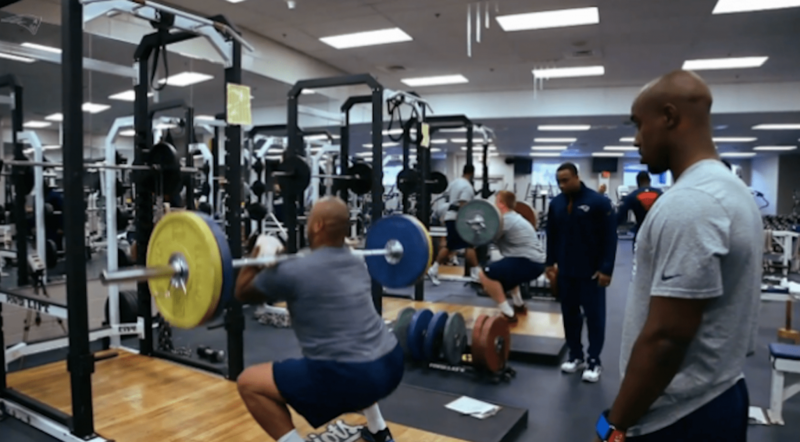 “Eye of the Coach” – The S&C Professional must listen and observe their players. They need to recognize who their best conditioned players are and acknowledge if these specific individuals are fatigued; it is likely many others are fatigued as well. In both Coach Parker’s and my years of implementing this philosophy of training, neither of us has ever heard a player state they were too fatigued to continue to train in this type of in-season program. An athlete has performed a successful technically proficient 500 pound back squat. A comparison of the work performed (stress) placed upon the body utilizing two (2) different in-season training sessions is noted below. The athlete has warmed up and has worked up to eventually performing a set of squats at 80% of their PR or selected program design weight maximum. Utilizing the mathematical formula for work i.e. Work = force X distance where the force is the barbell weight intensity and the distance we’ll assume to be 3 feet in both their squat exercise descent and ascent resulting in a total single squat repetition distance of 6 feet. Based upon a 500 pound squat, the work performed (stress) of a limited 80% daily routine vs. a 90% – 95% bi-monthly daily routine is presented in figures 2 and 3. The total work performed in all sets of Routine 2 is 20,250 ft./lbs. with a total of 8 exercise reps performed. This is a decreased workload of 1,350 ft./lbs. when compared to the lighter weight Routine 1 where 9 total exercise reps were performed. The quality of the work performed per squat exercise rep in Routine 1 is 5.3% less when compared to each squat exercise rep performed in Routine 2, i.e. 400 lbs. vs. 422 lbs. respectively. Lifting heavy weights during the in-season will not only maintain the athlete’s PQ weight room accomplishments achieved during the off-season, but often times new PQ PR’s are established during the in-season as well, at a time where optimal PQ and athletic performance are mandatory. The success of this in-season program is dependent upon many factors previously discussed, but none more important than the selection of the appropriate athlete to participate in such an in-season training program and a skilled S&C Coach to implement such a program. 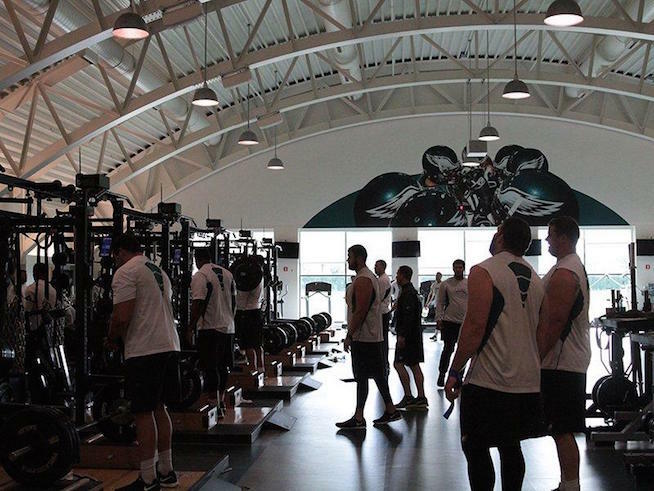 The type of training that transpires during the in-season of competition may be one of the last advantages the S&C Coach has available to employ against their opponents. Rob continues to rehabilitate, athletic performance train, as well as serve as a consultant to many NFL, NBA, MLB, NHL, Collegiate and University teams, coaches, and players. He has also presented his research at the International World Confederation of Physical Therapy in Washington, D.C. He is nationally renowned and lectures throughout the country with regard to the related fields of Sports Physical Therapy and the Performance Training of Athletes.